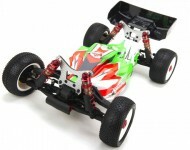 The S104 EK1 includes a variety of interesting design features that are unique to 1/10 scale 4wd buggies, including pivot ball front suspension, 14mm 1/8 scale style wheel axles with large diameter wheel hex adapters and wheel nuts, as well as a rear battery mount that can accommodate either a 2S LiPo saddle or 98mm shorty pack! Other features include an incredibly narrow aluminum chassis with a weight forward component layout, and silver carbon fiber shock towers. Plus, the rear shock tower features a unique design that incorporates a lower aluminum camber link brace for added rigidity. 14mm aluminum body, threaded big bore shocks will soak up the bumps and hard landings, and the mud deflectors help protect the shock shafts and seals from dirt and other contaminants.